1: The bullets were blanks. I've watched this shooting from both POV's dozens of times. Allison Parker (what was up with that black bracelet around her leg?) was shot five times in the neck, chest, torso, and shoulder area. She jittered and jerked a little, for effect, and opened her mouth and tried to look as terrified as possible, but if those had been real bullets, at that close range, there would have been instant blood, visible holes in her clothing, she would have been knocked back, and she would've dropped to the ground in only a few seconds. Remember the video of Walter Scott being shot and killed in North Charleston SC by policeman Michael Slager? Walter dropped to the ground dead in seconds and was shot from a further distance away than Allison Parker was! But Allison took at least eight "bullets" at close range without even losing her footing, and then turned around and ran, breakneck speed, away out of view, continuing to scream and shriek the entire time, through lungs that should have been punctured. No bloodstains were visible on the boardwalk or on the wooden handrails. The older woman, wearing white, was shot too; no marks on her either. And that's the whitest black-man hand I've ever seen. Come on! No muzzle flash. No shell casings were ejected. Those were blanks. He was very desperate for attention, and his voice showed no signs of sadness, shock, or legitimate grief. He then bizarrely followed this up by showing reporters a scrapbook of pictures, to try to prove, in a "you believe me, don't you?" manner, that he was really in a relationship with Allison Parker. This man is clearly a crisis actor. A worse actor than Robbie Parker of Sandy Hook. Odd how the name Parker keeps showing up wherever there is a government psy-op. 3. BBC's journalists Franz Strasser and Tara McKelvey were ordered by Virginia State Police to delete their footage of the crash of the suspect's car. And of course our suspect, Bryce Williams a/k/a Vester Flanagan, is reported dead, by suicide. How typical. "Also, I was influenced by Seung-Hui Cho. That's my boy right there. He got NEARLY double the amount that Eric Harris and Dylann Klebold got... just sayin," Flanagan wrote. "Yes, it will sound like I am angry... I am. And I have every right to be. But when I leave this Earth, the only emotion I want to feel is peace [...] The church shooting was the tipping point... but my anger has been building steadily... I've been a human powder keg for a while... just waiting to go BOOM!!!!" "We have got to do something about gun violence in America. And I will take it on," Clinton said. "It's a very political, difficult issue in America. But I believe we are smart enough, we are compassionate enough, to figure out how to balance the legitimate Second Amendment rights with preventive measures and control measures so that whatever motivated this murderer who eventually took his own life, we will not see more deaths, needless, senseless deaths." Clinton also called for universal background checks on guns. THIS IS THE SLOPPIEST FALSE FLAG THEY HAVE EVER TRIED. Even sloppier than Sandy Hook! Well, good article, but I wouldn't be using the Walter Scott psyop as any sort of "proof." Just saying. The latest update to this developing story: Daniel Wulz, Allison Parker's REAL boyfriend! So, as the sheeple continue to swallow more spoonfuls of Honey Nut Shitbag Raisin Bran cereal from their TV's and exclaim, "It's...Hooooooo- weeeeeeee!!!"... I've been noticing a disturbing silence about the Virginia Shooting Hoax from many former stalwarts in the truth movement. The very topic of the Virginia Shooting Hoax has thus become the new litmus test of who's real and who's a sellout. If you want to know if your favorite alternative news site is real, go to their main page of news articles and do a "Ctrl-F" and search for the word "Virginia" and if you don't see a mention of the hoax, they're compromised. Alex Jones and all of his Infowars staff - SELLOUTS!! They have been dead silent -- at this point, given their viewership / listenership, criminally silent -- about it. Information Clearing House: SELLOUTS! not a word! Aaron and Melissa Dykes (TruthStreamMedia): SELLOUTS! not a word! Mike Adams (naturalnews) - SELLOUT! Not a WORD about the Virginia Hoax, despite having published MANY articles about the Sandy Hook Hoax! Jon Rappoport's Blog: (see Mike Adams!) Was all over Sandy Hook, but absolutely NO MENTION of the Virginia Shooting Hoax. "If [the Virginia shooting] was [fake] (and I concede it very well might have been) then it was horribly botched conceptually, as the shooter, being black, gay, mentally ill, an Obama voter and having passed the background check to buy the gun, undermines all of the gun-grabber talking points. But, as part of a campaign to whip up race hate in the nation, it was effective! So I'll give him credit for that, at least. David Icke: NOT LOOKING TOO GOOD. His only mention about it on his site so far is a link to a video entitled, "What A Coincidence: Adam Ward Filmed An ‘active Shooter Drill’ 2 Weeks Ago" but absolutely nothing else. On the plus side, Jeff Rense is talking about it. GovtSlaves.info is talking about it. Activist Post is talking about it. DailySheeple is talking about it. Alternative-News-Network.net is talking about it. Intellihub is talking about it. BeforeItsNews is talking about it. Kevin Barrett is talking about it. I know, that's the strangest thing about this. A 9mm semiautomatic pistol is supposed to eject spent casings out of the slide ejection port. Even with ordinary blank rounds. But one curious thing I did find, that may or may not have been used in this psy-op, was something called Securiblank Loud rounds which are special blank rounds designed to work with a Simunition conversion kit for Glock pistols. According to the website they "virtually eliminate unburnt propellant and ejected particles" to ensure safety and "proper operation and cycling of the weapon." I cannot confirm if this type of round eliminates the spent casing ejection or not, only that they are cleaner than conventional blanks, and that they are only available to cops and military for training exercises. Hmmm....sure looks strange to me. He stood there a long time before he shot, strange. Surely if she'd been hit she would have gone down and not able to run. No blood. Hell fire, nothing is real anymore. Only that they want our arms. More proof of blanks being used in the above video. The truth is coming out and it is going viral on YouTube. If you do a YouTube search right now of "Virginia Shooting Hoax" you will now get ten pages' worth (and growing by the day) of videos put up by those who did their homework and are fully aware that this entire incident is indeed a fake! Meanwhile, the shills are in desperate damage control. There are some shills out there who are making absurd claims that a person can be shot with a Glock loaded with hollow-point bullets, not spray blood, and still be able run. They even use the Walter Scott example as their evidence of this, when it actually proves the opposite! As mentioned in my original post, Walter dropped to the ground in only a few seconds, never uttered a scream, and was already in a running motion. 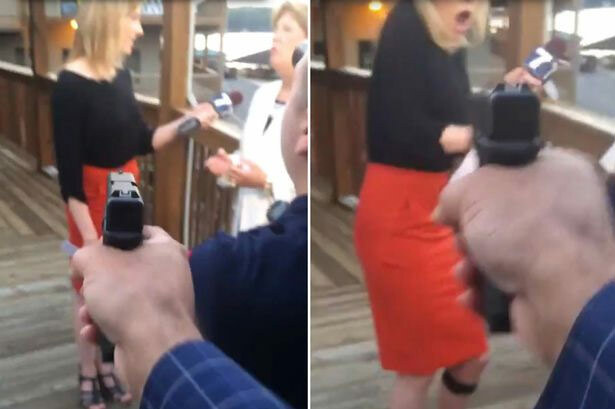 Allison, by comparison, went from standing with a microphone, to fake jitters for effect, to turning around and breaking into a sprinting run, in heels, all after supposedly taking several hollow-point rounds to the chest, neck, carotid artery, torso, and jaw. No blood spatter to be seen -- ANYWHERE. Were Allison really hit with hollow-points, her terrified "oh" face would not have been possible for her to make. Hollow-points are designed to expand outward upon impact. Her face would have transformed into a red, bloody, bulbous, unrecognizable blob by the 2nd or 3rd frame of the video after the first shot was fired. She would have been knocked clear into the wooded railing, and Vicki Gardner's white blouse would have been stained with blood spatter instantly. The perpetrators of this hoax are gambling that most people will never think to take a second look at the videos, because the content is thought of as "too gruesome" to watch. Actually it isn't gruesome at all, because no one got hurt or died!